Before we returned to Florida we did one more round of visiting friends and family. 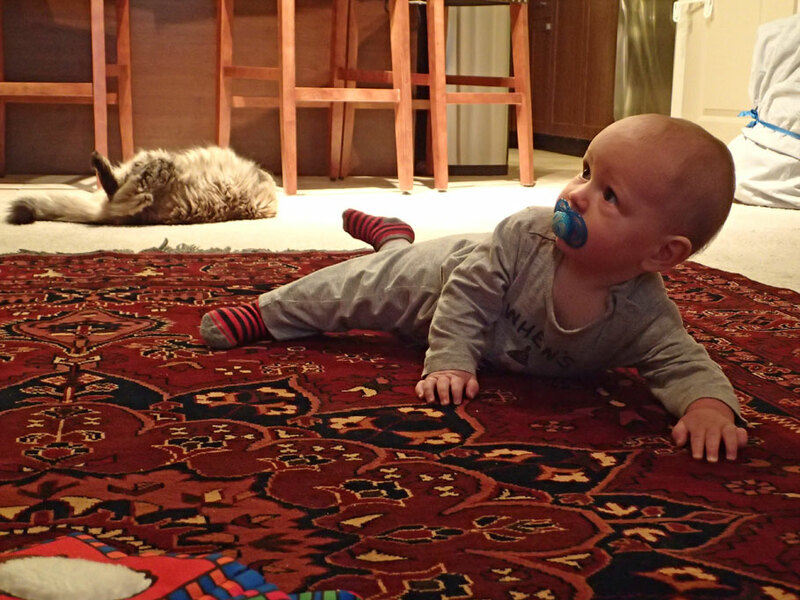 Here baby Gabriel is working on his mobility. Maybe he will be up for bigger adventures with us someday! October 22 – December 12, 2014. On October 22 we finally left Cabbagetown. Odd jobs were still rolling in, but the house sitting was growing thin and being that it was fall, our summer has just gone on for way too long. It was time to start thinking about being warm again and, of course, sailing. Although Greg had replaced the broken injector line on the van, Great Aâ€™Tuin was still in need of much TLC, so once again we took the slow route to Florida, making the trip to Stuart a two-day journey with me and the â€œmap ladyâ€ leading the way in the Honda and an overnighter in a truck stop. Luckily this trip was much less eventful than our previous journey to Florida and we only had one encounter with the Law (For those who are keeping a running tab â€“ this makes police encounter number 4). A state trooper stopped Aâ€™Tuin for excess smoke. Indeed, clouds of dirty black smoke were billowing out of Aâ€™Tâ€™s tail pipe far exceeding the 5 seconds allowable by law. The smoke is not a new problem. Great Aâ€™Tuin has been smoking all along, but this bad habit seemed minor or at least not as immediate as the vanâ€™s other problems. Now this little inconvenient truth of Aâ€™Tâ€™s could not be ignored any longer. The problem was much worse. Much, much worse. We explained to the trooper that we were trying to get somewhere were we could work on Aâ€™Tâ€™s coal rolling trouble. And again, perhaps due to our innocent faces or the luck of our birth, we were believed and let go with just a warning. Back in Florida we have spent our time doing various things. Gregâ€™s main focus has been weaning Aâ€™T off that smoke habit. I have been obsessively learning Spanish. I study 2, 3, 4 hours a day. I have been trying to get the blog up-to-date and redesigned and have started a small sewing project. We have done some socializing with sailing friends, land friends, and people who live in the neighborhood where we are staying in. And just a few weeks ago we started working on Blue Wing. 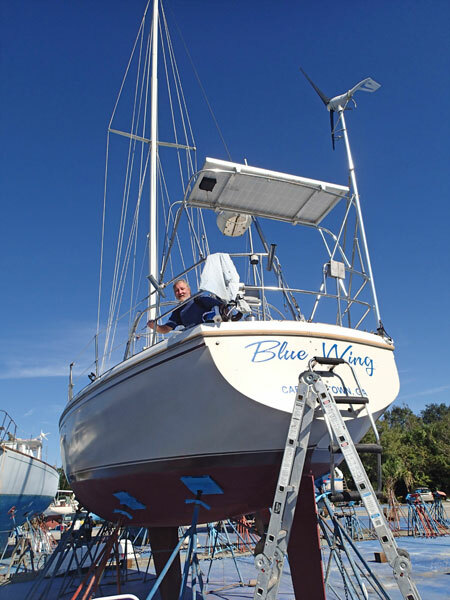 She went into the work yard in Indiantown where she has been stored since Spring for some new paint, new fiber glass in the battery compartment, a prop polishing, and a new coat of wax. On Thursday December 11, we splashed, but we didnâ€™t get far. Blue Wing wouldnâ€™t start. Ugh! The exact cause of the problem was not determined, but after the assistance of two different people and a can of Jump Start, we finally got her going. 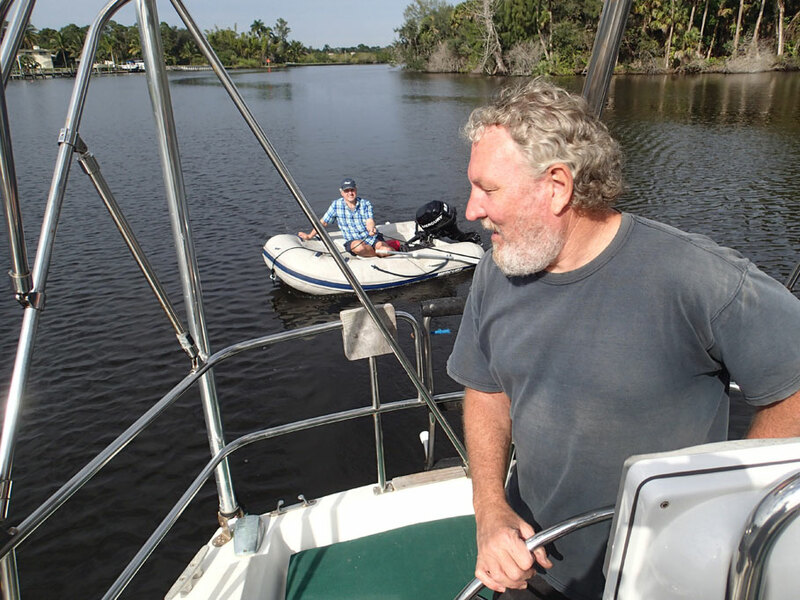 Today, December 12, we are motoring down the Okeechobee Water Way toward Sun Set Bay Marina in Stuart where we will grab a mooring ball and start to address all of Blue Wing’s problems, big and small, that have been piling up over the last three years. Our plan was to spend this sailing season in Florida working on the boat as we traveled, maybe going to Miami and the Keys, with our sights set on getting her in ship-shape for a trip to Mexico and Central America next winter, but now after Blue Wingâ€™s motor issue we have realized this needs to be a season without the distractions of sailing or adventure and being too far from our home base and land transportation. We will stay in Stuart and work on the boat until the only problem left is when to start happy hour. Within the next couple of weeks, some land travelers who are creating a web series about all types of nomads will interview us. We are very excited to tell the world about our journey, but right now I just feel so unworthy to be a part of their project. I feel so un-nomadic. We arenâ€™t going anywhere. We arenâ€™t even living on the boat, yet. But maybe you donâ€™t have to cross oceans or go to exotic places to have adventure. Maybe we will find some adventure in sewing boat canvas or installing a new autopilot. Maybe there is adventure somewhere on an obscure, hidden side road right off the big shopping mall of a highway called US 1 that runs up and down the Florida Coast. Maybe there is adventure in our back yard in the quiet little gated community where we are currently residing. And maybe the quandary of cocktail hour will come sooner than we think and we will raise Blue Wing’s sails and point her south, towards a destination we have never been. And maybe some more of friends will get to join us this year and share the adventure with us. Who knows? What ever happens, we will try to make it interesting and then tell you all about it. Cleaning Blue Wing up in the work yard. Can you see that shine on the hull! 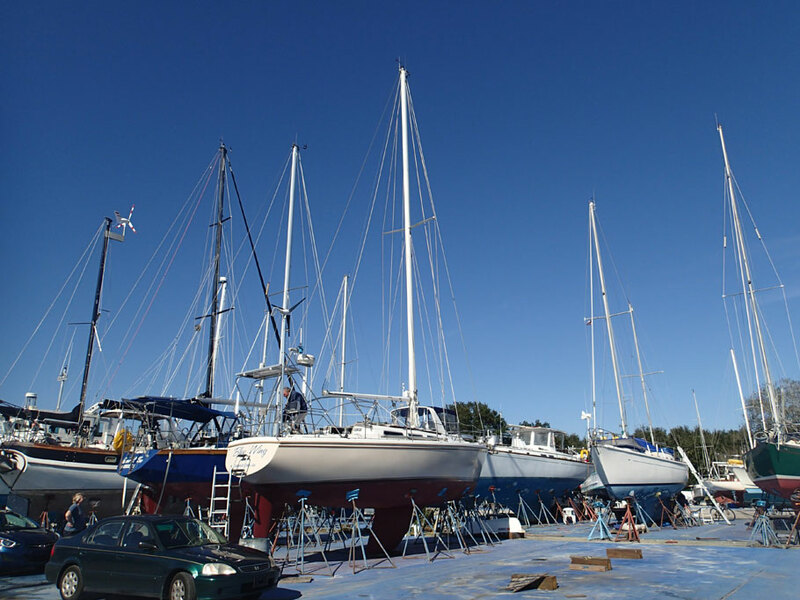 Blue Wing hanging with all the other boats in the work yard at Indiantown. So we are tooling down the Okeechobee Water Way on our way to Stuart when we see this guy rowing an inflatable dinghy. We slow down and as we pass him we call out to see if he needs assistance. He tells us that he has had engine trouble on his boat and was motoring back to his marina when he ran out of gas. We offered to give him a tow and he accepts, so we turned around and pull him behind us the rest of the way (over a mile) to his destination. We have received so much help from other boaters in our past there years on the water, it was great to give back a little kindness. 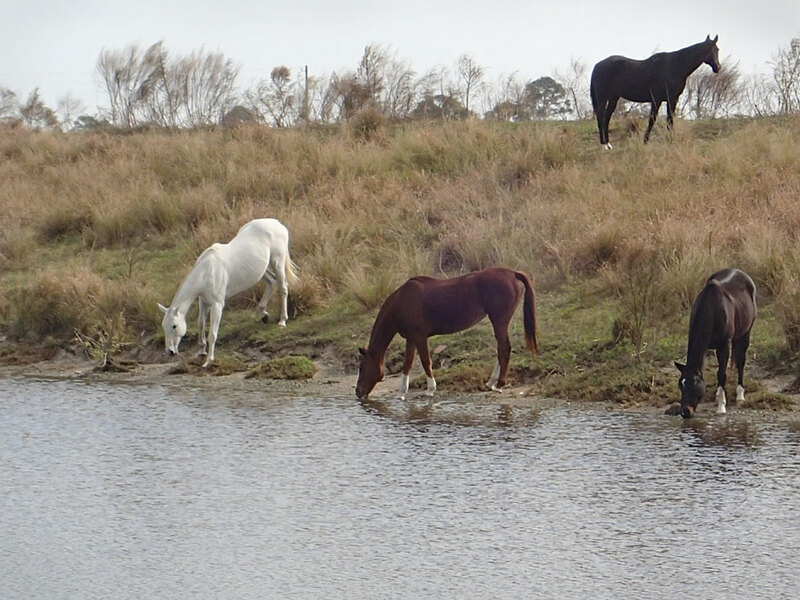 Horses come out for a drink along the Okeechobee Water Way. 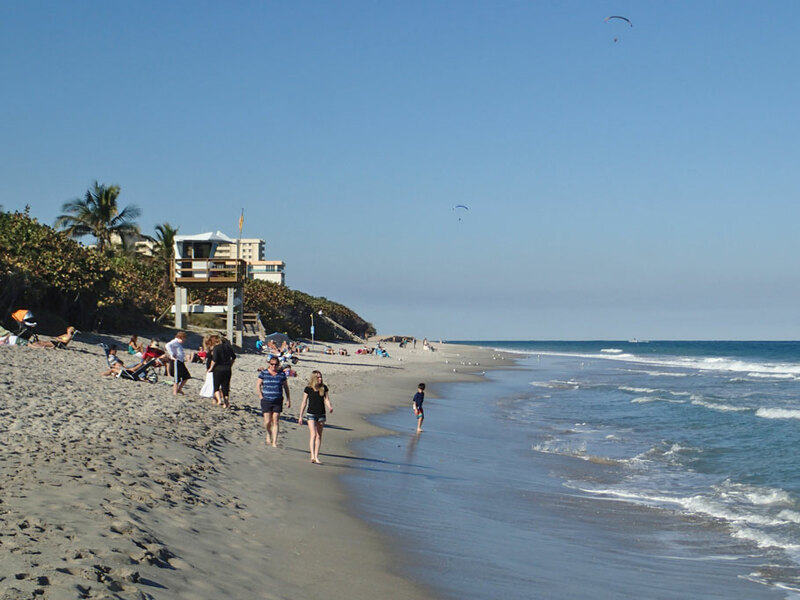 It has been a little chilly here in Florida, but that doesn’t keep people from the sun bathing, walking, taking photos, surfing and flying ultra lights at the beach. This entry was posted in Florida on the Water, Indiantown, Life on the Water, Travel On The Dirt, Van Life, Vanagon Westfalia. Bookmark the permalink.